I gave up making new year's resolutions a long time ago. If you don't make them, you can't break them, right? However, I do like to keep a mental list running in the back of my mind. Something to direct my focus, like a compass keeping me on the right path. As I reviewed my posts from the last year I realized that I've neglected my gluten-free friends. So, this year I need to follow that internal compass and shift my focus just a bit to bring you more delicious, gluten-free recipes. It's been a goal of mine for a long time, so in the year to come look for a larger variety of gluten-free goodies added to the mix. Of course, everything will always be peanut and tree nut free. So, without further ado, let me share my first gluten-free cookie of 2013 . . . Gluten Free Double Chocolate Biscotti. Biscotti and I go way back. We met inside a rustic Italian farmhouse just outside of Pisa. The terrible October wind was howling outside as only the Tuscan wind can, and inside I'd just finished a long, extravagant meal with new friends. I'd arrived in Italy just two months earlier, and was young and giddy with naïveté. So, when the dessert tray was presented I tried hard to conceal my excitement. Full of Italian delectables - tiramisu, zeppole, biscotti, and tiny amaretti cookies, like jewels, each wrapped in its own pastel paper package - the tray nearly overflowed. Excited as I was, I was also trying hard to feign maturity, so instead of diving right in, I chose one simple biscotto thinking it was the most "modest" choice. That first bite proved me wrong! 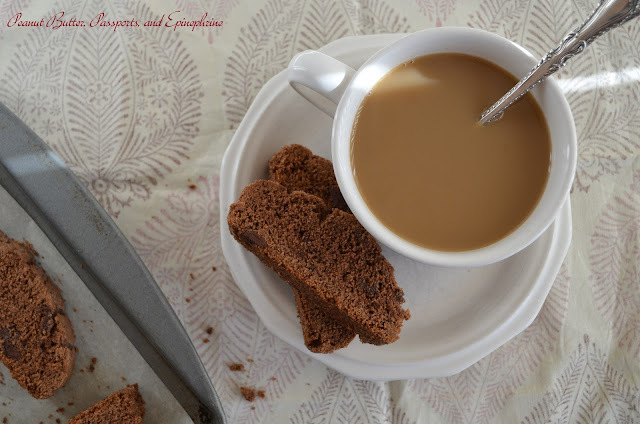 The delicate, crumbly texture, which seemed to hold together by magic until quickly dunked into my creamy coffee. The tantalizing crunch of toasted hazelnuts. But the thing I remember most about that first bite was the sudden burst of anise, so unexpected that it immediately conjured up images of childhood summers spent under tangled and twisted oak branches, chewing on lengths of thick, black licorice. 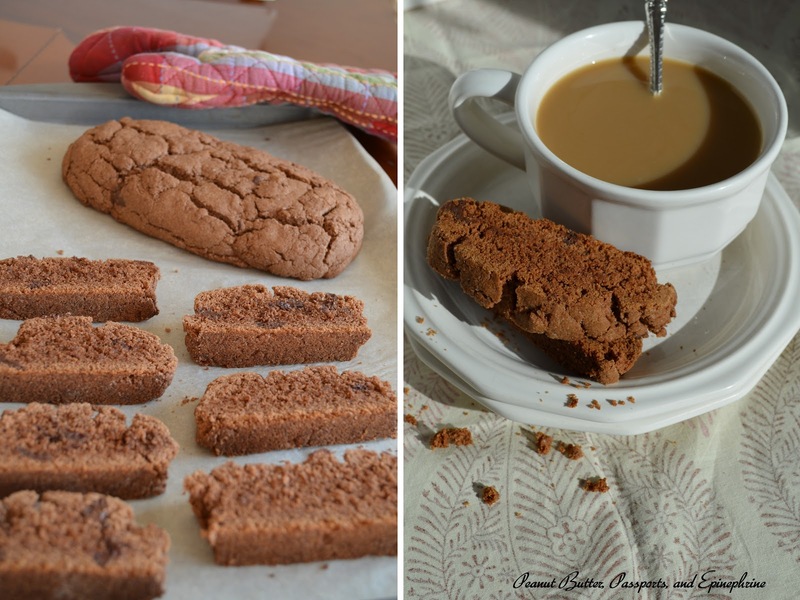 Biscotti became my cookie of choice, simply because of the striking anise flavour. Of course, I no longer add hazelnuts, but I still love to play with flavours and textures. 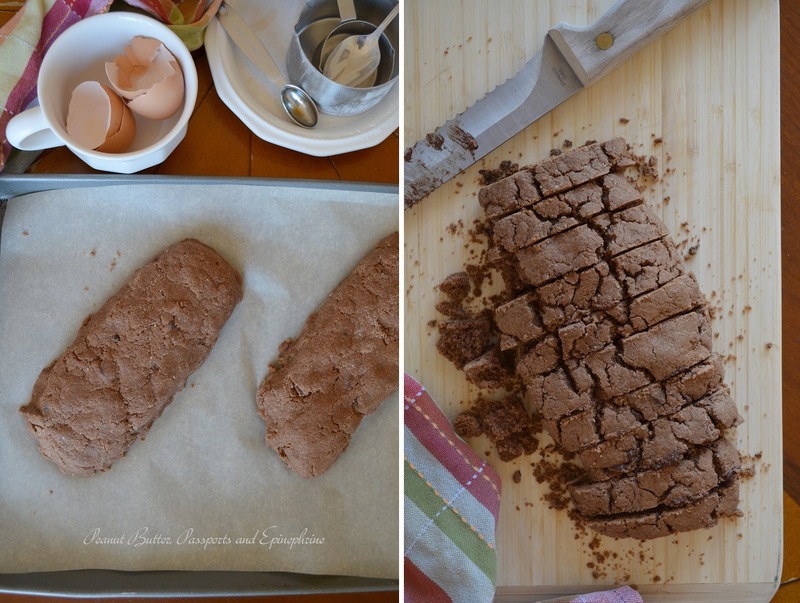 I fell in love with this gluten-free version the minute they came out of the oven. They're rich and chocolaty, and perfectly crumbly. Dare I say I like the texture of these more than that of some traditional biscotti. And, of course, there's that essential hint of anise which complements the chocolate oh so well. Simply perfection. Preheat your oven to 375 F (190 C). Line a baking sheet with parchment. In a medium bowl mix the baking mix, cocoa powder, baking powder, anise, coffee, and salt. Add the chocolate chips and toss to coat. In a large bowl cream the sugar and butter. Add the eggs and vanilla and mix well. Slowly add the dry ingredients and mix until blended. The mixture will be dry, but still hold together in your hand. Place half of the dough in a mound on the baking sheet. With your hands, form into a rectangular log that's approx. 7 inches long by 3 inches wide. Do the same thing with the other half. Bake for 30 - 35 minutes, until the loaves are firm and slightly cracked on top. Remove from the oven (but DO NOT turn the oven off) and allow to cool for at least 20 minutes. With a serrated knife, carefully slice the loaves into 1/2 inch slices. Lay the slices back on the baking sheet and bake for 15 minutes longer, until dry on the outside. Makes about 20 cookies. Hi Cindy! I'd be happy to share it at Gluten Free Fridays! Thanks, and have a lovely weekend!